The book has been updated and is better, all-new and improved they say. The early SFGs were not that great looking and are now much more attractive. But I still have the actual copy I first read – not because I stole it from the library! No, they sold it a few months later because some one had apparently watered it along with their garden. Silly person…Great sentimental value to me! 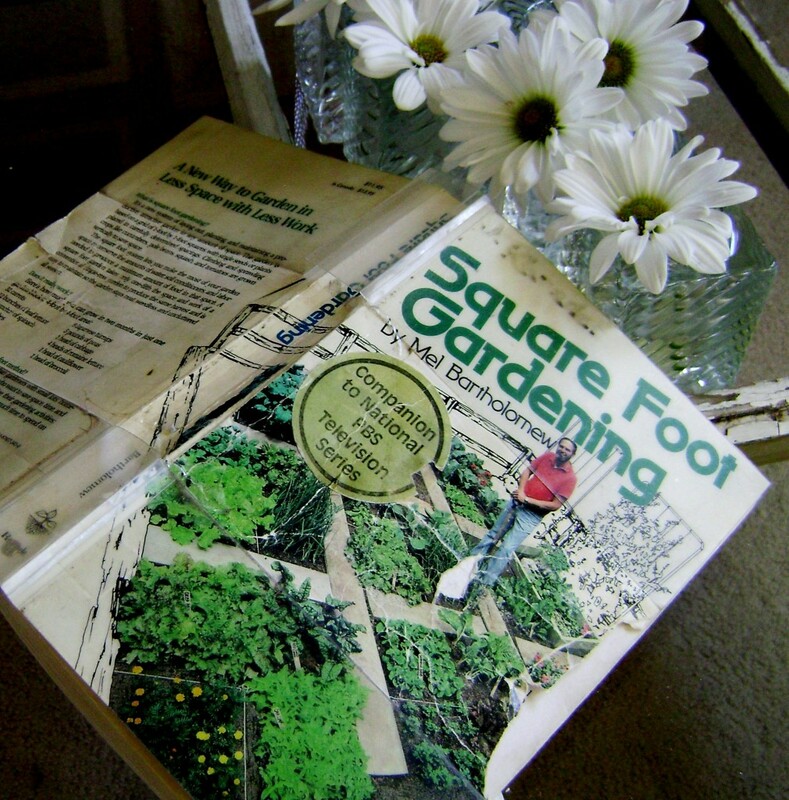 Mel, the Square Foot Gardener guru, says if you have never gardened, he can teach you all the principles of successful gardening in an hour. But if you have done “traditional” farm-style (rows and hoeing, for instance) gardening, it takes waaaaaaaay longer to teach you (can you say: hard-headed?). Luckily, I was a total novice, so I LOVE Mel! And I love all the produce I have been able to grow in very small spaces! to plant seeds in vermiculite which acts as a sponge to hold the moisture around the seed so it will germinate quickly. Gavin and I planted lettuce, radishes and spinach that way exactly one week ago and it has already germinated! Tiny little sprouts are smiling up at me! not to plant handfuls of seed and then go back and get rid of 2/3 of it (called “thinning”…there’s no thinning in SFG!). With Square Foot Gardening, you plant the right amount of seeds in a 1-foot space and enjoy every single thing that grows! to plant smartly: 16 radishes at a time. I have 16 growing right now. In a few days I will plant 16 more, and so on. Why would I plant an entire package of seeds at once when I cannot eat them all at once? weeding doesn’t have to take over your life because in a SFG, there is hardly any weeding! and he taught me how to get the BEST tomato harvest ever! And that alone makes Mel one of my all-time favorite people. This year I have discovered the Square Foot Gardening website along with instructions on how to grow potatoes. Mel’s current website: http://www.squarefootgardening.com/ …F U L L of incredible gardening knowledge! Good times! Uses 80% less space per harvest. And? It makes me feel so green! NOTE TO SELF: Never go another year without gardening! I’m very intrigued and planning to work on our little space on Mother’s Day. I think I’d better go get Mel’s book. I am a total novice, but I like the idea, plus, since I have no real idea what I’m doing, better to do some reading before I take Zach down the road with me. I fell in LOVE with SFG back in the 80’s when Mel was on PBS. It’s the only method I use. I finally got the courage to try a garden here again this year. So far I have tomatoes, spinach and lettuce planted, but this weekend will be more. However, where did you find vermiculite? Home Depot was less than helpful on that one. That is awesome, Denise. It really is the easiest way I have ever seen. No waste. No crazy techniques. It just works and kids LOVE it! Wonder how it would work with Seeds of Change (http://www.seedsofchange.com/).